Would you like to know how to make shrimp fettuccine with garlic butter sauce with a fairly easy shrimp fettuccine recipe? Shrimp fettuccine with garlic butter sauce is a delicious dish that I really enjoy preparing AND eating! 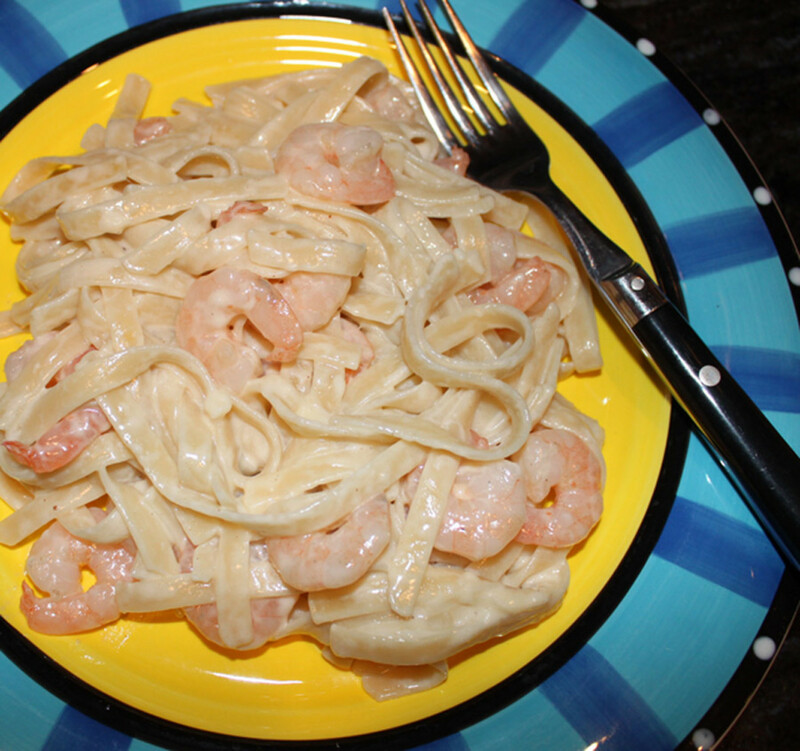 I like to make this shrimp fettuccine with garlic butter sauce for family and friends. If you are having visitors and want to serve a nice home cooked meal, shrimp fettuccine with garlic butter sauce is the dish for you. For this shrimp recipe, a top tip for making the shrimp fettuccine in the best way is to freshly prepare raw shrimp rather than using fully cooked shrimp from the supermarket. This is truly key for the best shrimp dish with the ultimate quality taste. 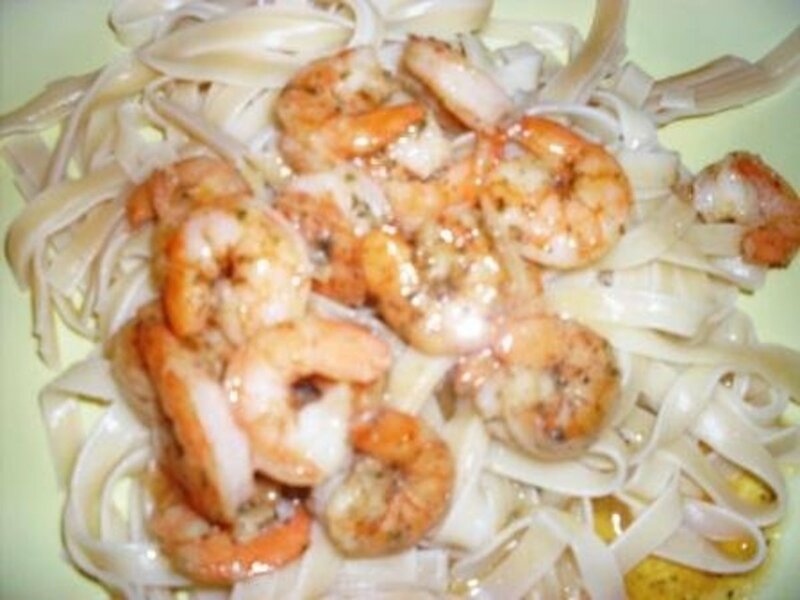 If you are not a meat eater or are trying to cut down on meat with some meatless days, this shrimp with fettuccine will do the trick as well. 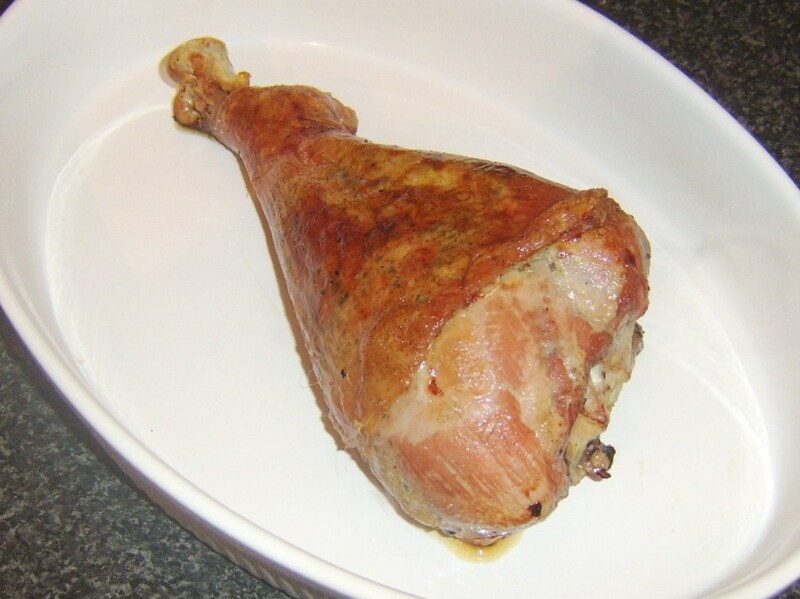 I'm a meat eater but on the days that I eat this dish, I don't miss having meat at all. The shrimp is a lowfat food but does contain cholesterol. This shrimp fettuccine with garlic butter sauce recipe also calls for the addition of butter so you might want to eat it only occasionally. This shrimp fettuccine with garlic butter sauce recipe is a most delicious way to prepare dinner for four for under $11. 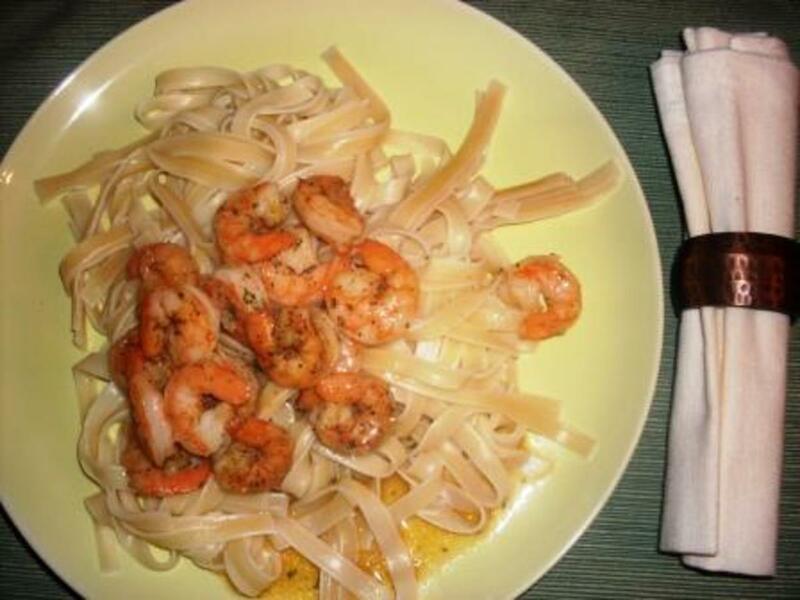 The shrimp fettuccine recipe can also be prepared for one to three individuals or more than the four. Just watch portion sizes of the shrimp fettuccine and plan accordingly. This pictures below are from when this shrimp fettuccine dish was prepared for two people- a large, hearty shrimp fettuccine dinner eaten at 6 in the evening with plenty of time to exercise it off (or sit and relax in front of the television, whatever you fancy). The point is that it's best to not go straight to bed with this big shrimp fettucine meal on your stomach. When I get tempted to go and get some delicious seafood at an expensive seafood restaurant, I will often make this shrimp fettuccine with garlic butter sauce dish instead. 3oz of meat or seafood is a typical serving but this recipe is much more generous portion. 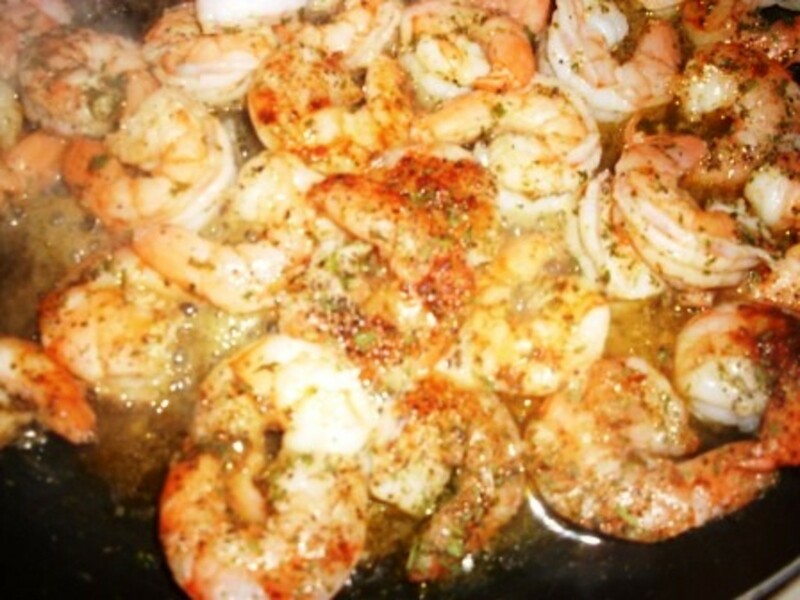 A 3oz portion of the shrimp would be 80calories, 1g fat, 18g protein, 165mg cholesterol. We've got to love it for all that protein but want to watch the cholesterol. I know I'm contradicting myself with the next ingredient, butter. To keep costs of ingredients low, you might want to use all of your own local supermarket brands. Approximately 7oz. of pasta was used in this recipe. Again, be vigilant if watching portion control. A proper serving for one is only 2oz, with 210cal, 1g fat, 44g carb, 2g dietary fiber, 2g sugar, 7g protein. For this recipe, each individual is served 3.5oz pasta, not 2oz. 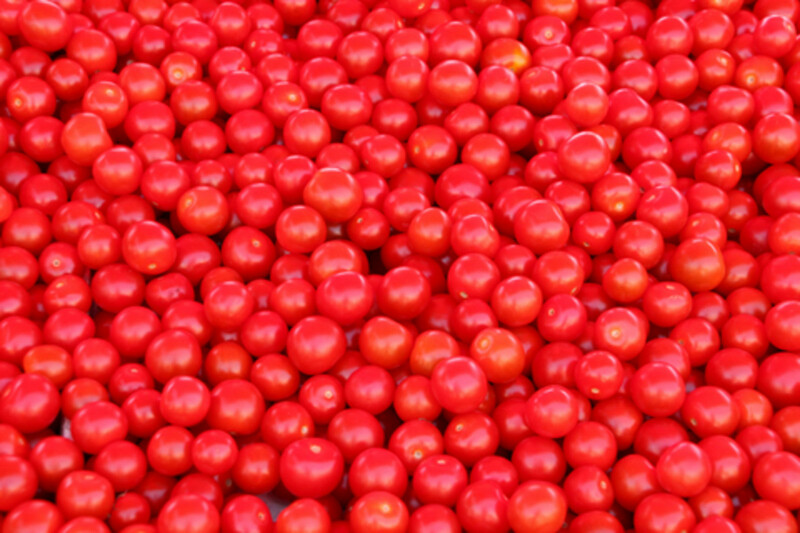 Reduce portions as you desire. Note that the butter and olive oil will add fat to the dish. 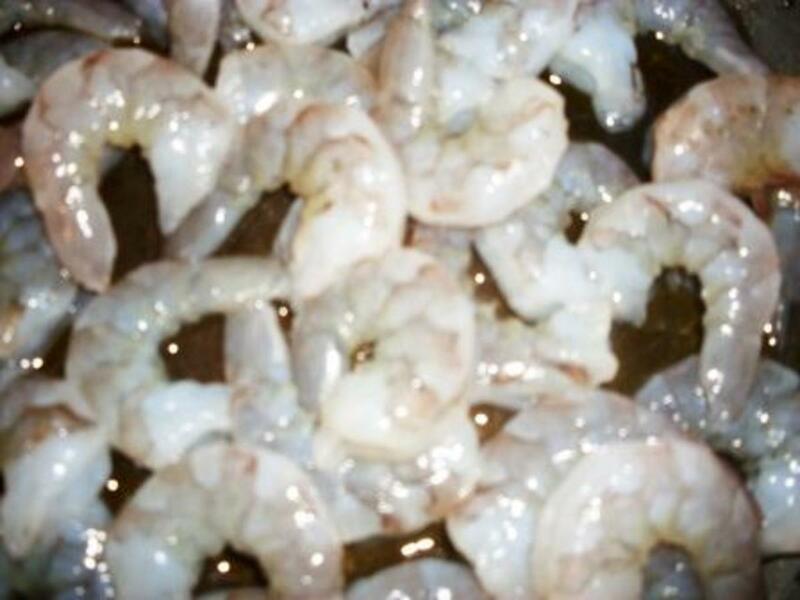 Steep frozen shrimp in a bowl of water to thaw for at least 15 minutes and then proceed with peeling or peel fresh shrimp immediately. 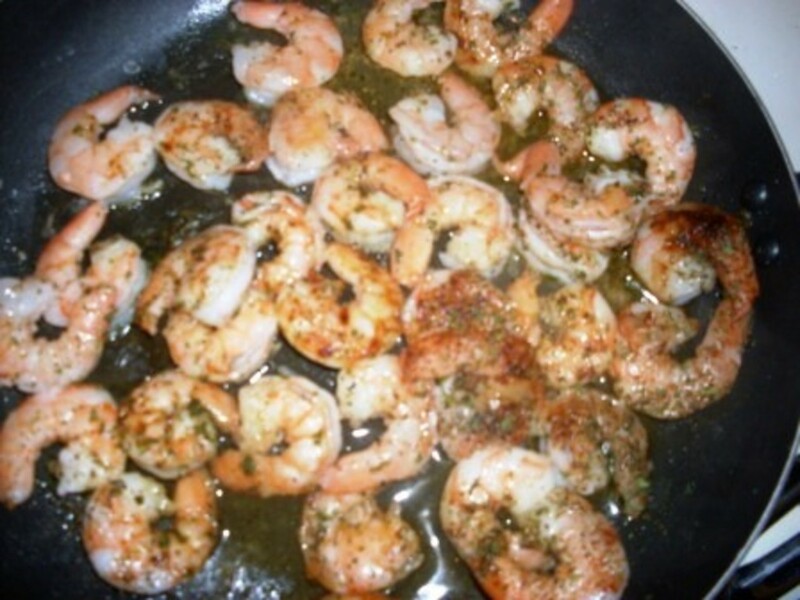 After you've peeled the shrimp, rinse it several more times with water, drain and place it in a skillet or frying pan that has been coated with olive oil and is beginning to pre-heat. 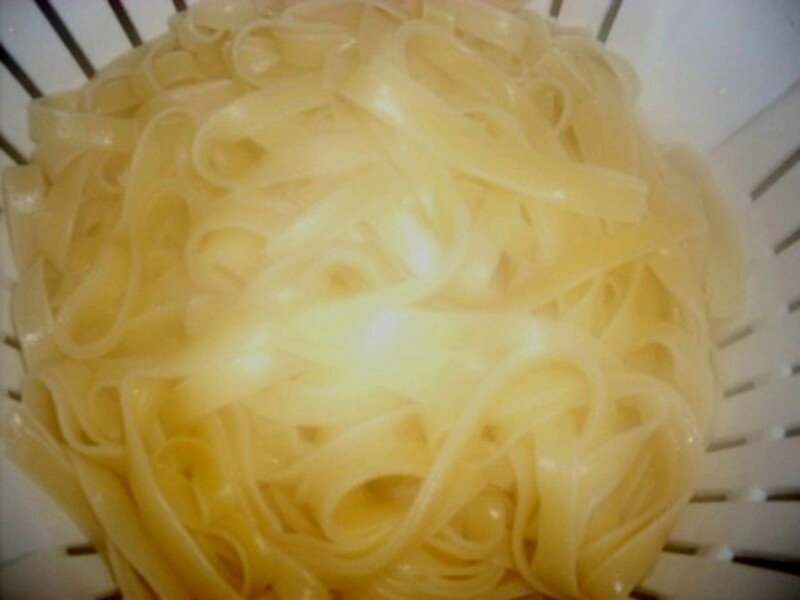 On another burner of your stove, you can simultaneously begin preparing the fettuccine pasta. 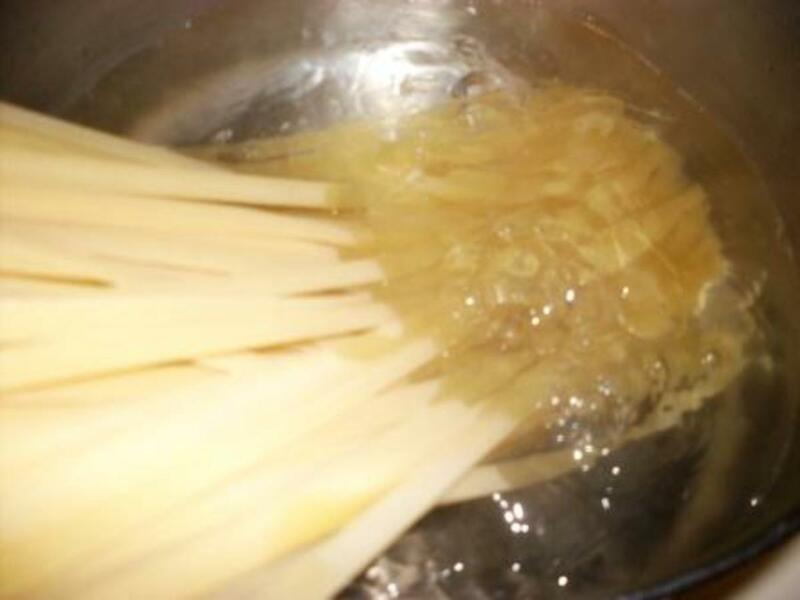 Put 4 quarts of salted water to a rapid boil in a fairly deep pot and then add the fettuccine. It will stick out of the top of the pot at first, but as it softens it will all be submerged in the water. Stir occasionally to prevent sticking to the bottom of the pot. 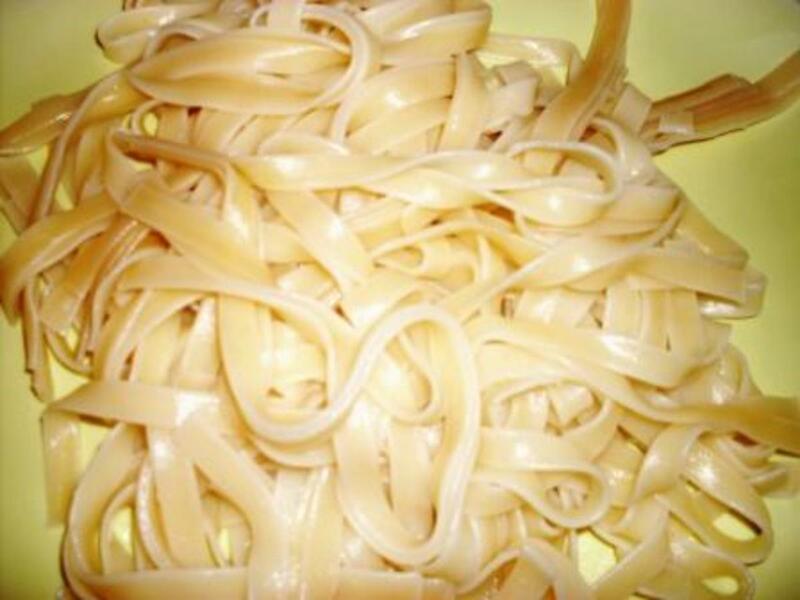 Allow the fettuccine pasta to cook for at least 8-10 minutes to proper soft consistency. Next, drain the pasta in a colander, before serving onto plates. You will place the pasta in the plates first, before adding the shrimp on top. 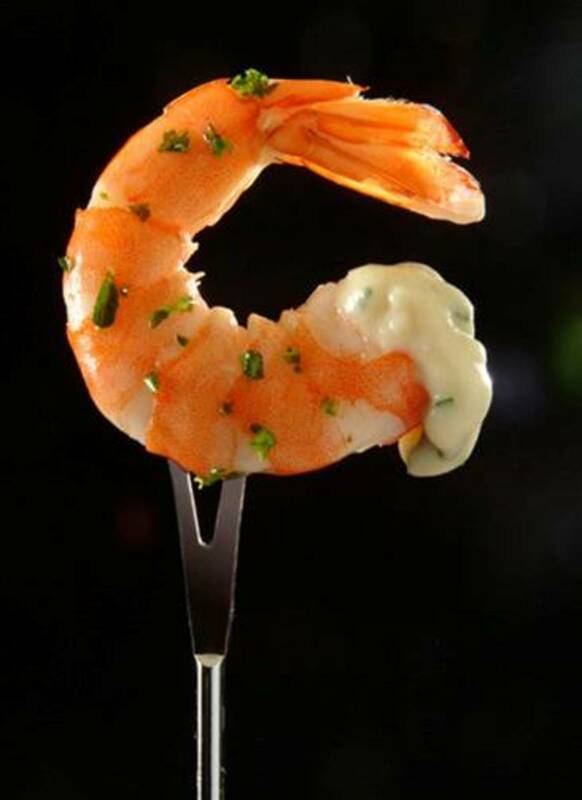 While the fettucine pasta is being given its time to cook, we can turn our attention back to the shrimp. The shrimp should have turned from silver / gray to pink by now, evidence that it is cooked. High heat should be reduced to low-medium at this time, an we can add generous dashes of all the spices listed above. Be especially generous with the garlic, amounting to approx. 11/2 tablespoons. That buttery flavor is awesome! The final steps would be include adding pats of butter into the pan and removing the pan from the heat as soon as the butter is fully melted. Use a ladle to spoon some of the shrimp with sauce onto the pasta. 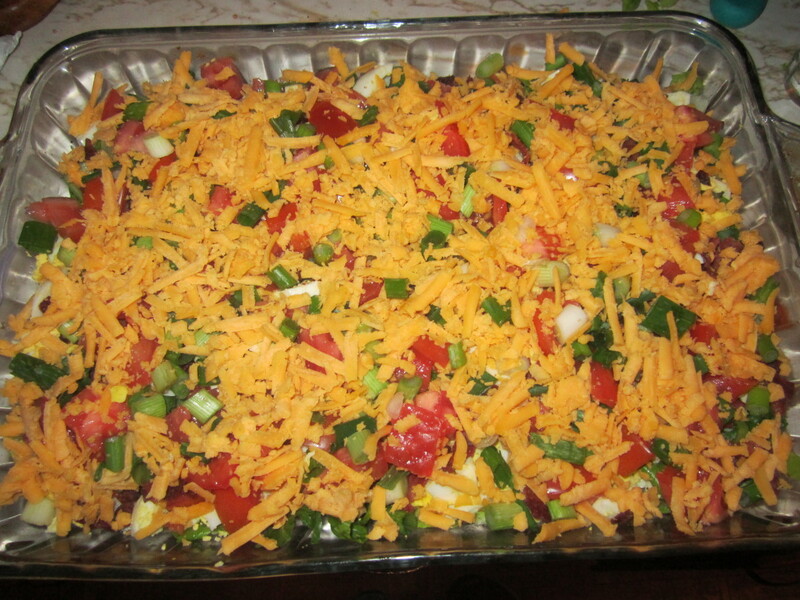 Optionally, sprinkle a bit of Parmesan cheese on top. This is a great way to prepare shrimp that you will enjoy. I love seafood, especially lobster, shrimp and calamari. 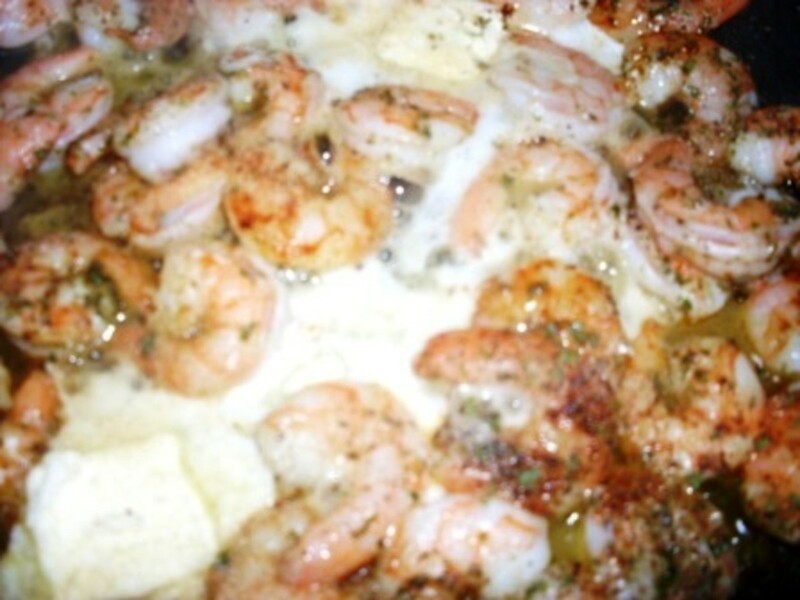 My family loves Shrimps and the combination of ingredients here looks interesting. I will make this with your instructions for sure. Thanks for sharing the details! Voted up and pinned! This looks simple and tasty. Must definitely give this a try. I am now retired, but my wife still works so guess who have to cook now! Thanks for your nice comment Vacation Trip! 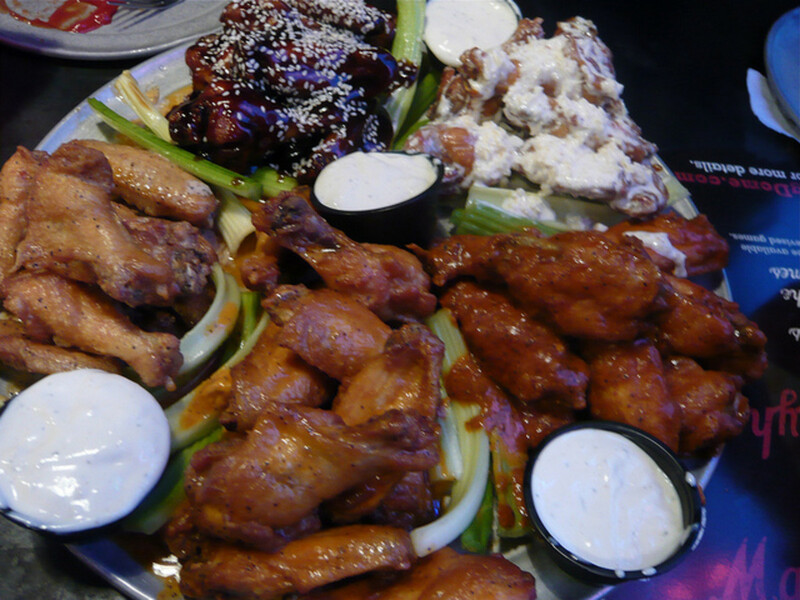 This is simply mouth watering. Can`t wait to taste them, will surely try this out. Thanks for sharing. Hi Sharon, thanks so much. I'm glad you liked it. 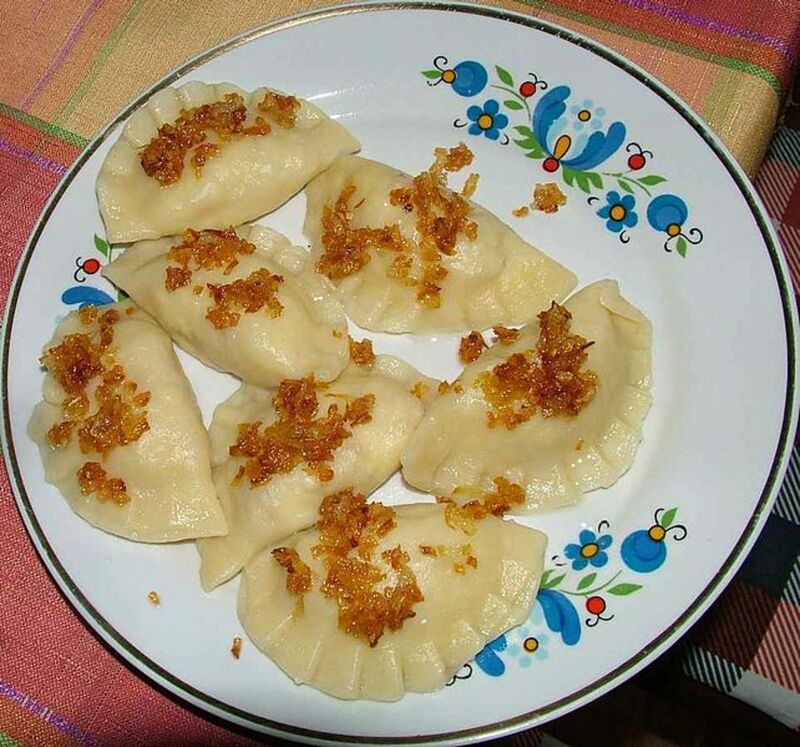 Tried this recipe and was great will be making again for sure. The Rope, thanks so much for your comment. I appreciate it! YUM! I can't wait to try this. Thanks for a terrfic recipe with great directions. Hi awsydney, thanks for your nice comment. I'm so glad you like the recipe. Enjoy! This recipe is making me hungry. We get great fresh seafood here in Sydney. Definitely on my agenda for next party. Thanks for sharing. I will surely try this out. Thanks for sharing. I love shrimps! OMG! I can totally smell it! I love making this, but never tried this way. Going to though. Thanks. Hi Triplet Mom, thanks for commenting. It really is very simple and doesn't take much time at all. Hope you enjoy. Journey - Wow that sounds like a very simple and yummy recipe I am going to have to give it a try. Thank you.